The lungs have both a bronchial and a pulmonary circulation. The bronchial circulation to the lungs is the part of the systemic circulation that supplies O2 and nutrients to meet the metabolic requirements of the lungs. 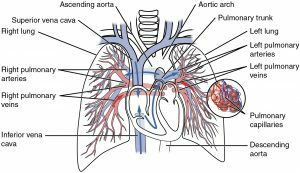 However the pulmonary circulation refers to the portion of the cardiovascular system which carries deoxygenated blood away from the heart, towards the alveoli of the lungs to undergo gas exchange, and then returns oxygenated blood back to the heart. In this article we shall consider the functions of both the bronchial and the pulmonary circulation and the special adaptations required to meet these. Deoxygenated blood leaves the right ventricle of the heart through the pulmonary valve and enters the pulmonary trunk. This divides into the right and left pulmonary arteries. In the lungs the arteries divide further into very fine capillaries at the alveoli, allowing gas exchange to take place. Oxygen diffuses from the alveoli into the pulmonary capillaries while carbon dioxide diffuses from the capillaries into the alveoli. This newly oxygenated blood leaves the lungs through the pulmonary veins to the left atrium of the heart, completing the pulmonary cycle. The blood is then distributed around the body via the systemic circulation. 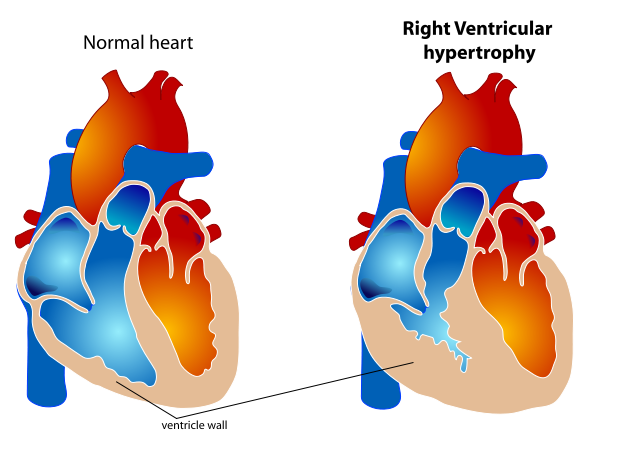 Since the right heart cannot work independently of the left heart both the right and left ventricle must have the same cardiac output to prevent blood building up in either the systemic or pulmonary circulation. This means the pulmonary circulation must be able to accept the entire cardiac output (5L). Low resistance – short, wide pulmonary vessels, many capillaries running in parallel, rather than in series like the systemic circulation. There is relatively little smooth muscle in the arterioles which helps to reduce arterial tone. A short diffusion distance – the combined thickness of the alveolar endothelium and the capillary endothelium is approximately 0.3µm. The very high density of capillaries also means that the alveolar wall is always close to a capillary. Hypoxic pulmonary vasoconstriction – ensures poorly ventilated areas (that don’t have much oxygen to take into the blood) and not perfused and poorly perfused areas (which can’t take much oxygen into the blood) are not ventilated. See ventilation perfusion matching. For efficient oxygenation of the blood it is important that the ventilation of the alveoli is matched by their perfusion, with an optimal V/Q ratio of 0.8-1.0. To maintain this V/Q ratio, blood must be diverted away from poorly ventilated alveoli and directed towards better ventilated alveoli. This is ensured by hypoxic pulmonary vasoconstriction, whereby alveolar hypoxia results in vasoconstriction of the pulmonary vessels supplying that area, hence reducing perfusion of the poorly ventilated alveoli. Fluid formation in tissues is determined by starling forces. Increased hydrostatic pressure of the blood in the capillaries pushes fluid out of the vessels at the arterial end while oncotic pressure (exerted by large molecules such as plasma proteins) draws fluid back into the capillary at the venous end. The low capillary pressure of the pulmonary vessels minimises the formation of tissue fluid in the lungs. This means that only a small amount of fluid leaves the capillaries, and nearly all of this is reabsorbed, which protects against fluid formation in the lungs. 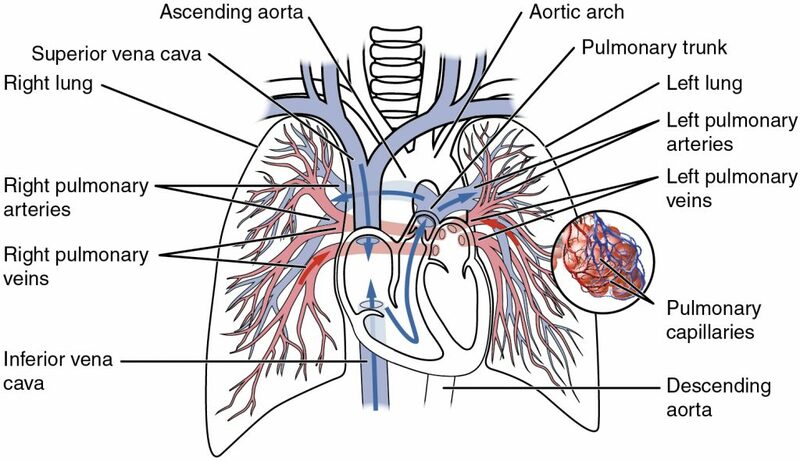 The bronchial circulation is not involved in gas exchange, its role is to supply fully oxygenated arterial blood to the lung tissues themselves. The bronchial arteries receive blood from the thoracic aorta and the upper intercostal arteries. They enter the lung at the hilum and branch at the main bronchus. One portion of these arteries supply the lower trachea, extrapulmonary airways, and supporting structures and drain into the superficial bronchial veins. These veins join the azygous (from the right lung) or the accessory hemiazygous or intercostal vein (from the left lung), before reaching the inferior vena cava to enter the right heart. The bronchial arteries also supply the intrapulmonary airways as far as the level of the terminal bronchioles, where they form extensive anastomoses with the pulmonary vasculature. This portion drains via deep bronchial veins within the lung, which join the pulmonary veins to travel to the left heart. In chronic hypoxia there is widespread vasoconstriction of the pulmonary vessels due to (the normally protective) hypoxic pulmonary vasoconstriction. This chronic hypoxic vasoconstriction causes a chronic increase in vascular resistance, leading to pulmonary hypertension. This increases the afterload on the right ventricle, causing right ventricular hypertrophy and diastolic right heart failure. Chronic hypoxia can occur at altitude, or as a consequence of a lung disease such as emphysema. If the pressure inside the pulmonary capillaries rises, then more fluid will leave the capillaries. This can occur if left atrial pressure rises (such as in mitral valve stenosis or in left ventricular failure). Not all of this extra tissue fluid will be reabsorbed, and so will build up in the lung tissue. This is known as pulmonary oedema. Pulmonary oedema impairs gas exchange lungs by increasing the length of the diffusion pathway. It can be treated using diuretics and by treating the underlying cause.